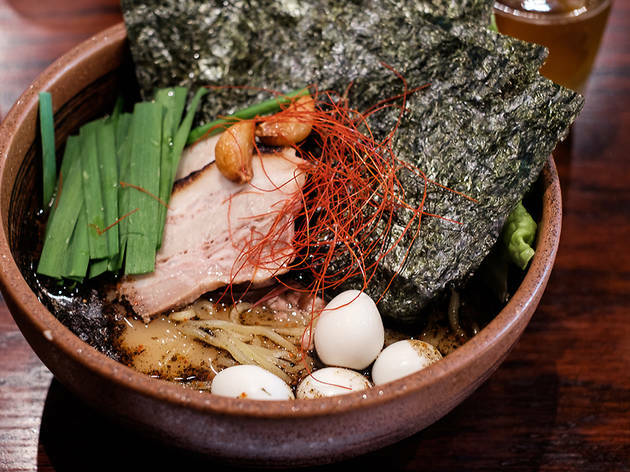 At this well-known spot, the specialty is pork ramen in a spicy garlic broth flavored with whole cloves of roasted garlic and heaped with curly noodles. The line begins to form a half hour before opening at the dimly lit, 24-seat Dojo, which is hailed by many as the best ramen bowl in the Bay. 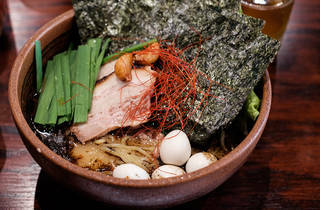 It's one of three restaurants helmed by ramen king Kazunori Kobayashi (he also owns Santa Ramen, below), but each of the triumvirate specializes in its own unique style. Here, the specialty is the pork ramen in a spicy garlic broth, flavored with whole cloves of roasted garlic and heaped with curly noodles. Choose your own toppings—which include quail eggs, spicy cod roe, bamboo shoots and kikurage mushroom—as well as your level of spiciness, from mild to extra spicy.